Hypoglycemia or low blood sugar can be a common problem in small breed dogs especially in Shih Tzu puppies that are smaller than the average size. It only takes one lost puppy to realize just how real and devastating this condition can be. I had just such a case recently, which cause stress and sadness to the puppy buyer and raised questions in my mind. In my case, a perfectly healthy, playful but tiny Shih Tzu puppy was Vet checked just a day before she was due to go to her forever home. Visitors to our home played and interacted with the puppy. Within 4 days, of being in her new home, the puppy was dead. How could this happen? Hypoglycemia was the most likely diagnosis and confirmed by the new puppy owner’s veterinarian. 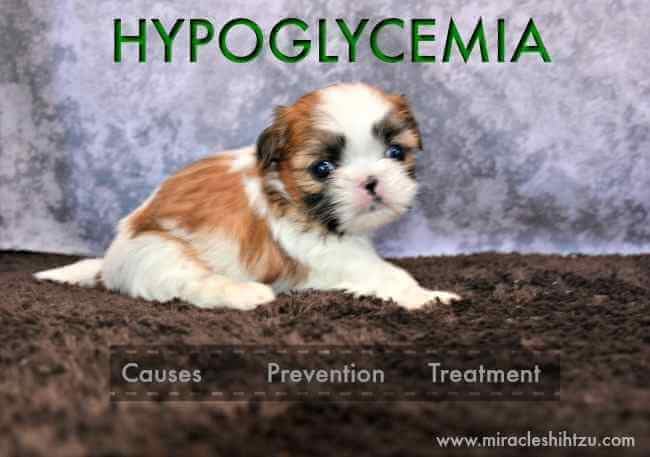 Hypoglycemia occurs when the sugar level in the puppy’s blood drops rapidly and can be fatal if not treated immediately. While this is rare in most Shih Tzu puppies, it can happen, and anyone who adopts or purchases a puppy should be aware of the symptoms and ways that it can be prevented. Larger breed dogs are not as susceptible to hypoglycemia. 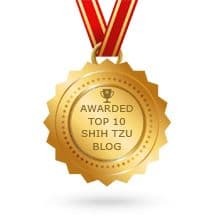 The most common times that this occurs is usually between birth and about 4 months of age but can occur later in tiny Tzu dogs that have not eaten in a while or have other underlying problems. When very young puppies experience low blood sugar, it is called Juvenile hypoglycemia and is the result of an imature body system that has not fully developed the ability to regulate the blood sugar or glucose concentration coupled with a higher than normal requirement for glucose. When glucose or sugar levels drop in the blood, there is less energy for the brain which causes neurological signs such as tremors, discoordination, and eventual coma. This occurs rapidly, and anyone who is contemplating the purchase or adoption of a small breed dog should know the signs and first aid treatment to save the puppy. In older dogs, hypoglycemia may occur when there is too much time between meals and too much activity such as vigorous exercise. Hypoglycemia may also occur in conjunction with other diseases such as Addison’s Disease, Severe liver disease, and insulin producing tumors of the pancreatis. What Causes a Blood Sugar Drop? Stress is one of the leading causes of hypoglycemia in a tiny puppy. Typically this happens when an 8 week old puppy goes home for the first time. The stress of the new environment can bring it on, but additional stressors such as too much excitement, too many people dissending on the new puppy, too much activity, play and not enough rest. Most 8 week old puppies are able to maintain their internal temperature, but severe chilling will cause stress and shock that may lead to a lack of appetite and subsequent hypoglycemia. 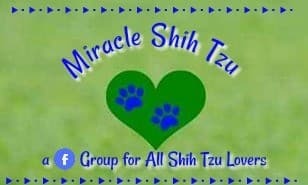 Do not allow a tiny small breed dog such as a Shih Tzu to get chilled. Dogs are generally considered to have some form of internal parasites if not dewormed at regular intervals throughout puppyhood. Most conscientious breeders will deworm at 2 week intervals beginning at 2 weeks of age, finishing this deworming schedule by the time the puppy is due to go home. If not worming medications have been given, it is important to begin by submitting a stool sample to your veterinarian for evaluation and worming medication. Intestinal parasites can debilitate tiny puppies, so it is important that this issue is ruled out as a possible cause of hypoglycemia. Sometimes puppies get overly worked up with a dynamic play that is extended by excited owners who overtire the puppy. If the puppy misses a meal, they are a good candidate for hypoglycemia. Some puppies may not be hungry at meal time, so conscientious owners will take the food up and withhold it until the next scheduled meal time. This is the method that many trainers will applaud as the best way to get a puppy on a schedule and thus get the puppy potty trained as soon as possible. A change of diet can also cause hypoglycemia. If the breeder does not provide food, you should ask about the diet and keep the puppy on the same familiar diet at least for the first week or so. Even if you do plan on making changes to the diet, the first couple of weeks is not the time to make that change. Modify the food over the course of a couple of weeks. Sometimes it is not one but many causes that brings on hypoglycemia in tiny puppies. A tiny Shih Tzu puppy is being placed in a new home at about 8 weeks of age. The puppy has been with her mother and litter mates for the last 8 weeks old and is now thrown into a new environment without the help of the familiar. New environments mean new sights, smells, and people. Add a couple of children who are very excited to get a new puppy and spend time touching, petting, picking up and playing with the new puppy. New puppy parents may not realize that too much stimulation is not a good thing, so even what may be perceived to be a short play session may be just too much for a small dog. Neighbors and friends come to visit and add to the stress. The puppy by now is too tired to eat and misses a meal. The puppy finally falls asleep and when she awakens there is no food to eat. By the time the next meal is served, the puppy is too weak to eat. This puppy is in crisis. If immediate treatment is not given, the puppy is not likely to survive. It is easy to prevent, but much harder to treat. Keep stress to a minimum. A healthy new puppy is stressed just by leaving the breeder’s home and entering a new home. We can’t eliminate that, but we can keep stress at a minimum. Make homecoming as low keyed as possible. Don’t plan on allowing visitors for the first few days. Discuss the needs of the puppy with your children and insist that the children enable the puppy to rest according to the puppy’s schedule. Short play sessions separated by potty breaks, meal time and nap time is crucial for reducing stress in young puppies. Maintain the food schedule that the puppy is accustomed too. Keep food out at all times. Small breed dogs such as the Shih Tzu should have access to kibble all of the time even if you are serving meals 3 or 4 times a day. Free feeding with food that the puppy likes and will eat will prevent most cases of hypoglycemia. Make sure your puppy is actually eating. Do not switch food initially. Follow your breeder’s instructions even if you feel the food may not be the highest quality. Change foods very gradulally over the course of a couple of weeks. If your puppy doesn't eat, first try altering the food such as adding hot water to make it more palatable. You can also add a little Nutri-cal onto the food to increase calorie intake. Ask your breeder if worming medications have been used and request the schedule that should include the type of medicines and the dates administered. Avoid extreme temperatures in young puppies. Shih Tzu puppies are hardier than most in low temperatures, but they should not be expected to remain outdoors in frigid weather just to assure potty training success. Indoor Pad training may be necessary for locations where winters are harsh. Keep a tube of Nutri-cal or Forti-cal on hand and offer a pea size dab to the puppy about 3 times per day. Even this small amount can provide the calories and glucose needed for tiny puppies. At first, you may not pick up on hypoglycemia, but you might notice some mild symptoms that signal your dog is not eating. A puppy that vomits a green, yellow or clear bile may have an empty stomach. If you notice this, provide food immediately and assure that the puppy eats. If the puppy doesn’t take the food, you may need to go to the next emergency treatment that includes providing a fast acting source of sugar that will elevate the blood glucose levels in your small puppy. Read Emergency Treatment Methods below. A puppy that becomes sleepy, listless, weak, and staggers as he walks is likely suffering from low blood sugar. The puppy loses his appetite and may tremble, show muscle twitching and pale gums. Seizures may occur as the puppy goes into shock. If uncertain that the puppy does in fact show signs of hypoglycemia, pick up the puppy and watch him take a step or two. If he lays back down or acts uncoordinated, he may be in trouble. A lethargic puppy is a sick puppy and not one to be ignored. Without any treatment, the puppy will go from lethargy to seizures to coma to death. 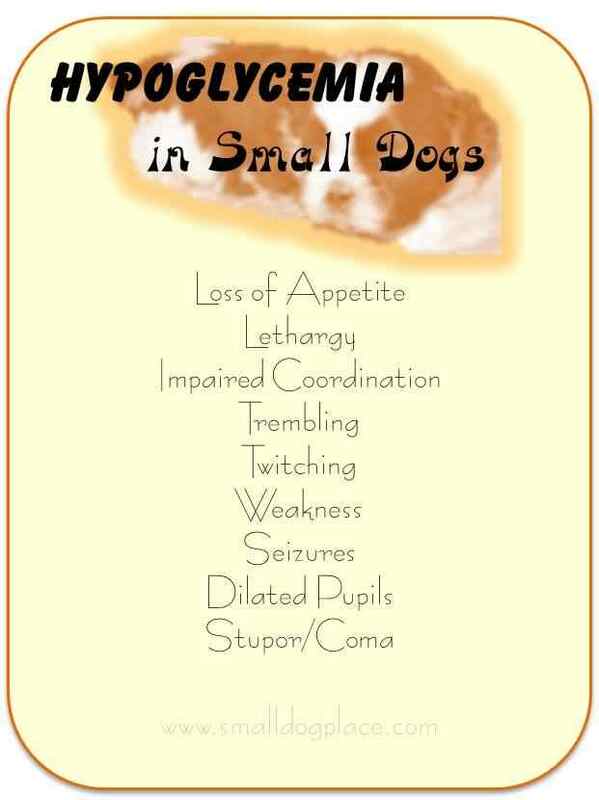 The best way to treat this potentially life threatening condition is to get a quick source of sugar into the puppy. Time is critical, and you should not wait to see what happens. The trick to saving your puppy is to act quickly. Honey or Corn Syrup may be used as an emergency treatment. You can also use syrup such as you use on pancakes, or even jelly, but not grape jelly. Put a dab on your finger tips and rub it onto the roof of the puppy’s mouth or along his gums. Watch to assure the puppy swallows and ingest the honey or syrup. If the puppy will drink, offer sugar water. If not, use a dropper and dab sugar water into the mouth. Better yet, stock your first aid kit before your puppy arrives with a tube of Nutri-cal that will provide immediate sugar along with other nutrients. 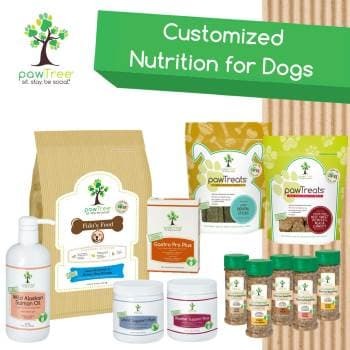 If your dog does respond to the treatment, follow the high caloric, sugar treatment with dog food that is highly palatable such as can dog food. This will prevent another crash. Next, wrap you your puppy in a warm blanket or set up a heating pad to keep their internal temperature up. If these emergency methods do not work, find the nearest Emergency Veterinary Hospital and go immediately. Do not wait to see your usual vet. This is a life and death situation and waiting even 24 hours is not likely to produce a good outcome. The veterinarian will do a complete medical history and physical examination. Test, usually done in older dogs include blood counts, urinalysis, and routine blood chemistry. Ultra sound may be used to rule out tumors and other possible causes. Ultrasound is usually not done in small puppies due to their size. Diagnosis is generally made by the history you provide and the physical examination. 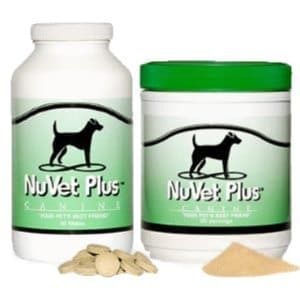 Fluids may be given and many treatments with supplements such as Nutri-cal and prescription diets. In older dogs that have underlying conditions, treatment is aimed at the disease causing the hypoglycemia. Glucose may be given intravenously if the oral route does not produce results. Know that any small breed dog is a candidate for developing hypoglycemia and be prepared before the puppy enters your home. Keep some form of sugar (or glucose) on hand for emergency treatment or better still, purchase a tube of Nutri-cal to plac in your dog’s First Aid Kit. Plan homecoming to be as stress-free as possible with few people and emphasis on the puppies needs. Keep food out at all times for free feeding, at least initially to allow the puppy to take the lead with feeding. Ask about worming schedules and seek out help from your veterinarian. Avoid allowing your puppy to get chilled and stressed. Act quickly at the very first sign that something is wrong, supplementing with a high sugar alternative.